Low back pain is a common problem for many people. Different things can cause it, including injuries and certain conditions. You can help prevent low back pain by learning how to sit, stand, lift, and exercise correctly. Low back pain varies by person. It may be a dull ache or a sharp, stabbing pain. It could be acute (short-term) or chronic (ongoing). You may have pain in other parts of your body, as well as your back. your pain doesn’t improve or gets worse after 2 to 3 weeks. Injuries are a common cause of low back pain. Examples include a muscle strain or spasm, ligament sprain, joint problem, or a “slipped disk.” A slipped disk, or herniated disk, has to do with your spine. It occurs when a disk between the bones of your spine swells or bulges and presses on your nerves. Twisting while lifting often causes this. Many people who have a slipped disk do not know what caused it. You may have low back pain after doing an activity you aren’t used to, such as lifting heavy furniture or doing yard work. Sudden events, such as a fall or a car wreck, can cause low back pain. You also may have low back pain from an injury to another part of your body. Visit your doctor if you have low back pain. They will review your symptoms and health history and do a physical exam. Based on this information, they may perform tests. These include an X-ray, computerized tomography (CT) scan, or magnetic resonance imaging (MRI). Tests help to diagnose the cause or rule out other causes. Can low back pain be prevented or avoided? There are several things you can do to prevent or avoid low back pain. These include learning correct posture and strengthening your muscles. What’s the best way to sit? Sit in chairs with straight backs or low-back support. Keep your knees a little higher than your hips. Adjust the seat or use a low stool to prop up your feet. To turn in your chair, move your whole body rather than twist at your waist. When driving, sit straight and move the seat forward. This helps you not have to lean to reach the controls. You may want to put a small pillow or rolled towel behind your lower back if you must drive or sit for a long time. What’s the best position for standing? Maintain good posture while you stand. Keep your ears, shoulders, and hips in a straight line, with your head up and your stomach pulled in. Try not to slouch or arch your back. These put added pressure on your lower back. Wear shoes that are comfortable and provide support. If you stand for long periods, rest 1 foot on a low stool to relieve pressure on your lower back. Every 5 to 15 minutes, switch the foot you’re resting on the stool. What’s the best position for sleeping? The best way to sleep is on your side with your knees bent. You may put a pillow under your head to support your neck. You also may put a pillow between your knees for added comfort. If you sleep on your back, put pillows under your knees and a small pillow under your lower back. Don’t sleep on your stomach unless you put a pillow under your hips. Use a firm mattress. If your mattress is too soft, put a 1/2-inch plywood board under the mattress to add support. Always stretch your back and body before you exercise. For a gentle stretch, lay on your back with your knees bent. Slowly raise your left knee to your chest and press your lower back into the floor. Hold for 5 seconds. Relax and repeat the exercise with your right knee. Do 10 of these exercises for each leg. In addition to back exercises, it’s important to stay active in general. Swimming and walking are good exercises to improve your overall fitness. Most people who have low back pain can treat it on their own. Often the pain goes away in a few days or weeks. You may need 1 to 2 days of rest for a hurt back. Too much rest though can cause your muscles to weaken, which can slow your recovery. Even if it hurts, try to walk around for a few minutes each hour. This helps keep your back muscles strong. with your hips and knees bent and your feet on a chair. Heating pads can help to relax painful muscle spasms. Use heat for 20 to 30 minutes at a time. Ice packs and massages may give relief as well. Over-the-counter medicines can reduce pain and swelling. These include aspirin, acetaminophen (brand name: Tylenol), naproxen (brand name: Aleve), and ibuprofen (brand names: Advil and Motrin). People who have ongoing back problems need treatment to manage the cause. Being overweight can make back pain worse. If you are overweight, you may need to lose weight. You may need to exercise or improve your posture when you are sitting, standing, sleeping, or lifting. Severe cases of low back pain may require medical treatment. This could include prescription pain relievers or injections. It could include physical therapy or wearing a brace to support your back. Work with your doctor to create a treatment plan for your low back pain. It will depend on the cause of your pain and if it is acute or chronic. Once your low back pain has gone away, practice things to prevent future injury and pain. What’s the best way to relieve my pain? 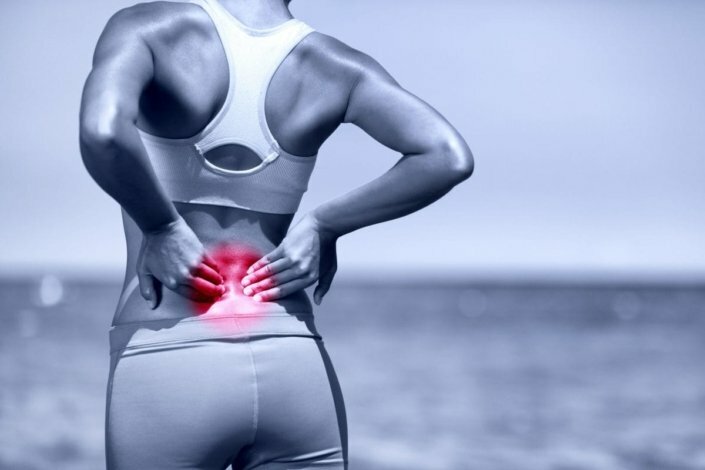 How can I prevent a low back injury? Will improving my core strength help? Are there any other lifestyle changes I should make to avoid low back pain?